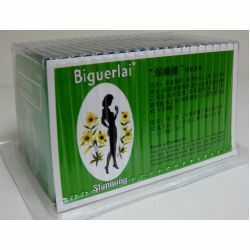 Used to promote bowel movement, relieve constipation, and reduce excess body fats and fluids. Each 2 g of tea bag contains 1.5 g of senna fruits and 500 mg of senna leaves. Soak the tea bag into a 6 oz. cup of lukewarm water and let it steep for 20 minutes only in order to get the best result. Only take one tea bag/ cup a day. This product should not be given to patients with intestinal obstruction or with undiagnosed abdominal symptoms. Extreme care should be taken in patients with inflammatory diseases. Over dosage of this product can result in diarrhea with excessive loss of water and electrolytes, particularly potassium.